Yes, I suspect it may come to that. The real irony is that one party in this country seems hell-bent on pushing us into poor relations with Putin, even at the risk of an escalation that could be catastrophic for the planet. Real Patriots, eh? Strange times indeed, if Hillary were at the helm, I don’t even want to think about it. It takes me to the site, not sure what the issue is. Sorry. It's a tabloid from the UK. So they landed the guy that judges how many more troops are to be deployed. Jesus. How does this affect the US, though? We don't have to stick our noses into this situation and we definitely don't have to invade Venezuela. Guaido would have been a nice change from Maduro, but it really isn't our place to put him there. If anything it would de-legitimatize him. They accused the US of preparing to enter Venezuela about a month ago. What do we think - Archduke Franzferdinand Nicolas Madura shot by Gavrilo Princips an “American Agent” this time next week? Think Cuban missile crisis in a few years (months?) No reason for such a contingent except to send a message, act as an advance party, etc. Vlad is sticking his nose into our back yard and nothing good will come from it. OTOH, if he does, we can feel free to stage nuke-capable cruise missiles in Poland, for example. Maybe he's just looking for a bargaining chip. Iran, OTOH, would love nothing better than to stage IRGC and missiles there if they can. THAT would be a line we shouldn't allow them to cross. They start putting ballistic missiles that are capable of reaching the U.S. into Venezuela, Vlad would need to be told to put his boys in a safe place while we uh, dismantle that capability. Nah. Maduro will only hold out as long as Moscow and Tehran hold him up with force or aid. That would cost him the same as it has Bashar. He'd have to give up parts of his territory. I'm not sure the Venezuelans would take kindly to that. They aren't as beaten down as the Syrians are. A proxy war might ensue and the supply lines for Russia and Iran are a LOT more vulnerable and expensive to maintain. I don't think anyone in the Pentagon wants to invade ANYONE ELSE. Maduro is currying some bad allies to be bringing into this hemisphere. The red line would have to be ballistic missile emplacements. THAT cannot be allowed. I don't think Putin wants that fight here in our hemisphere but it won't hurt him to send a message that he can play in our back yard as well as we can play in his. 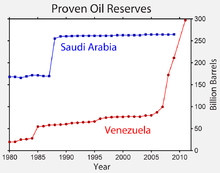 Venezuela is reported to have the biggest oil reserves in the world.. The people there voted for Hugo and his "fairness" for the poor. Now, despite the nation literally floating on a sea of oil, the people are starving. Occasional Cortex and her crowd think that system is just dandy for the U.S. At some point, these maniacs are going to have to be reined in. Putin cannot be allowed an easy win here. No need for violent conflict, yet. But he needs to pay a very harsh price in real damage to his economy if he makes any serious moves to inflame the situation there. country to break ranks and run a successful economy without it being fully controlled..? I would be amazed if Trump gave an order to invade Venezuela. Bomb their military bases or blockade their ports for a while, maybe. The people of Venezuela voted for Guaido and Maduro ignored them. He's aligning himself with enemies of the U.S. and if allowed to entrench substantial forces so close to our shores it would be a serious, costly problem at some point. No one here wants war with Venezuela and it would be a very hard sell but if the nation sees Russian or Iranian forces being built up, that sentiment could change rapidly. Why all of this talk of war? You would think Hillary was President after all. President Trump trusts President Putin and has good relations with him. The Russians and Iranians both have expertise in oil production, they are probably just going in to help put the country back on its feet. Or maybe Bee is right, It is just the fake news media still trying to destroy Trump. this is looking more and more like Syria 2.0 and Ukraine. the first step to replacing Maduro is to arrest or kill him. if he's surrounded by Russian "advisors" it makes it harder since their loyalty cannot be bought. and if they intend to assassinate him with his Russian body guards around him then that would be grounds for Putin to escalate. alternatively if Maduro decides to bug out the Russians can make sure that doesn't happen. it would seem the beginnings of another civil war. i don't think its fake news since they said the very same in Crimea, Eastern Ukraine and Syria. Or maybe Bee is right, It is just the fake news media still trying to destroy Trump. you mean the same caution when the Russians denied involvement in Ukraine and Crimea? remember how they denied the troops were Russian regulars? it would seem the beginnings of another civil war. i don't think its fake news. yes it would seem so. America and Russia are playing the same game. only Russia is playing it better.